From day one, Brunet-García’s mission has been to build brands that inspire meaningful change. 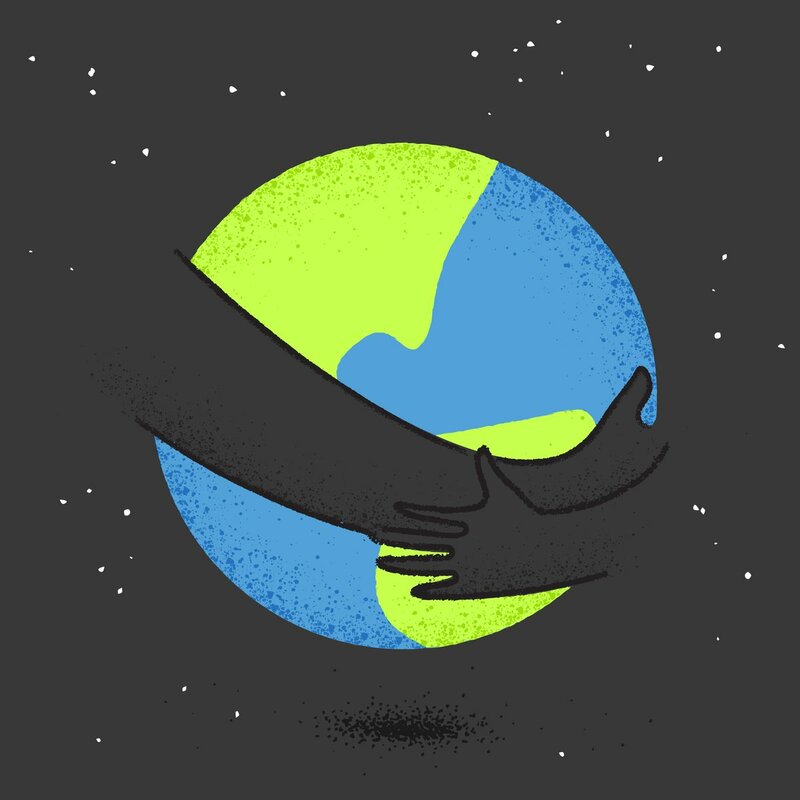 That often means partnering with nonprofits that can make a large social impact. Brunet-García gives time and talent to many nonprofits in Northeast Florida. On #GivingTuesday, Brunet-García is highlighting the work of seven organizations—and donating $300 to each—to inspire you to support what they do. Launched in 2012, #GivingTuesday is a global day of giving fueled by the power of social media and collaboration. On the Tuesday following Thanksgiving, #GivingTuesday kicks off the charitable season, when many focus on their holiday and end-of-year giving. The Cathedral Arts Project (CAP) mission is to enrich the quality of life in Northeast Florida through unleashing the creative spirit of young people. 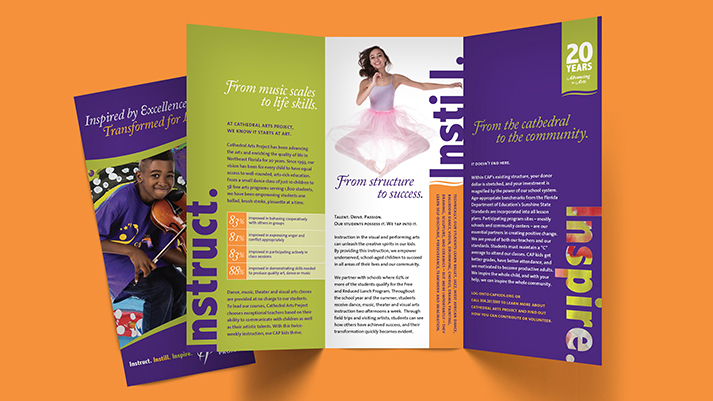 By providing access to instruction in the visual and performing arts, CAP empowers underserved, school-aged children to succeed in all areas of their lives. Brunet-García has created multiple campaigns for CAP’s programs and exhibitions as well as its young professionals’ group, the CAPtivators. Feeding Northeast Florida (FNEFL) aims to establish food security across eight counties. An estimated 281,000 people in Northeast Florida struggle to put food on the table: 80,000 of those individuals are children. FNEFL distributes more than 22,000 pounds of fresh produce and high-quality food to community partners like City Rescue Mission, Trinity Rescue Mission, Beaches Emergency Assistance Ministry (BEAM), Salvation Army, and The Sulzbacher Center. 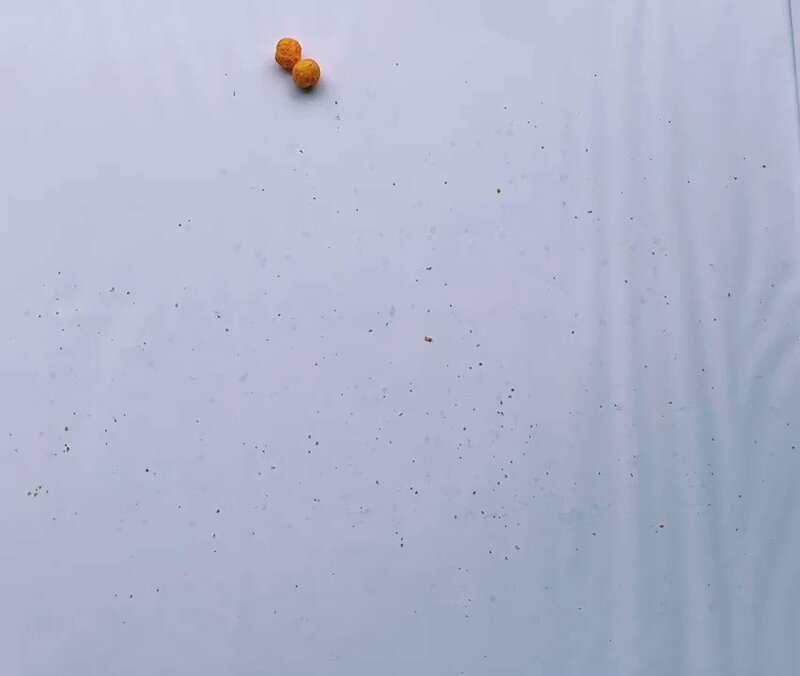 In 2016, Brunet-García created “100 Plates,” an interactive installation using conductive ink to trigger animated projections that bring the issue of food insecurity to life. The 5 & Dime tells stories that engage, inspire, entertain, and challenge audiences, nurturing a rich artistic culture in Jacksonville’s urban core. From its new home on Adams Street, the nonprofit introduces new audiences to the power of live theater through a season of six full productions, three staged readings, and several live cabarets. Brunet-García is a longtime supporter of the 5 & Dime, and Senior PR Manager Denise M. Reagan serves on its board. 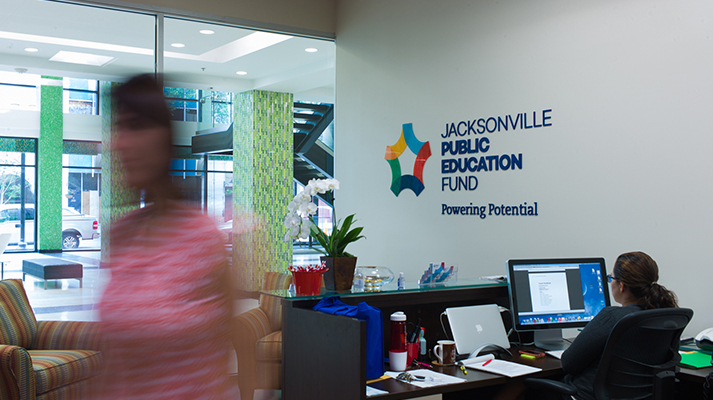 The Jacksonville Public Education Fund (JPEF) is an independent nonprofit organization that works to connect research with a civic voice to bring about unified action in support of universally high-quality public schools for all children in Duval County. 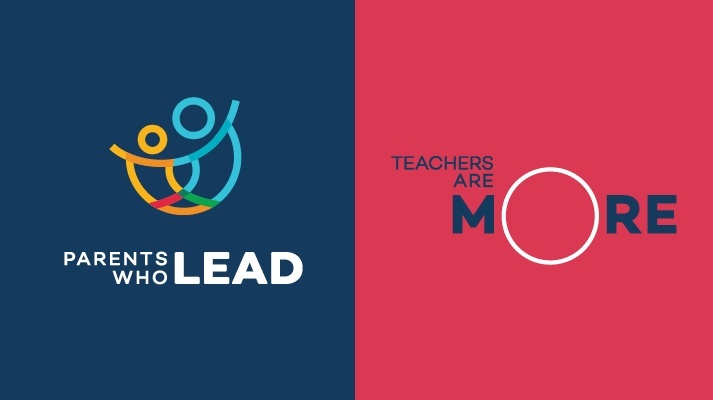 The nonprofit believes that an informed and active citizenry, together with attentive and aligned community leadership, will move schools forward to prepare students with the skills they need for future success. Four core strategies form the basis of their work: research, community mobilization, advocacy, and strategic investment. 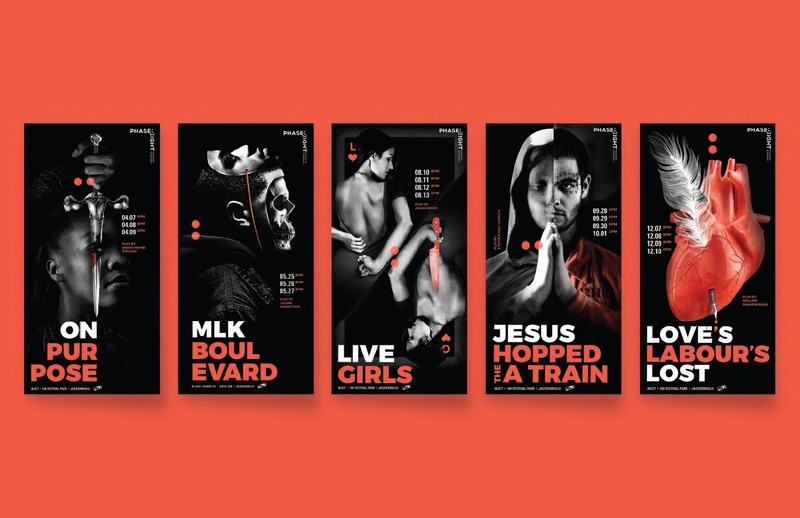 Brunet-García created JPEF’s visual identity and the branding for its grassroots ONE X ONE initiative, and the agency continues to support JPEF’s work through creative projects. Phase Eight Theater Company is an ensemble-based theater company devoted to fostering great actors through contemporary performances that are to be shared with modern audiences. The group aspires to be Florida’s premier theater institution by developing new voices for the American stage by producing new works that speak to the culture of our region, cultivating and nurturing the talent of actors in the company, and creating exciting productions that recognize multi-generational and cultural experiences. Brunet-García gave the organization a new name and a brand that continues to communicate its mission. The St. Johns Riverkeeper mission is to be an independent voice that defends, advocates, and activates others to protect and restore the St. Johns River. 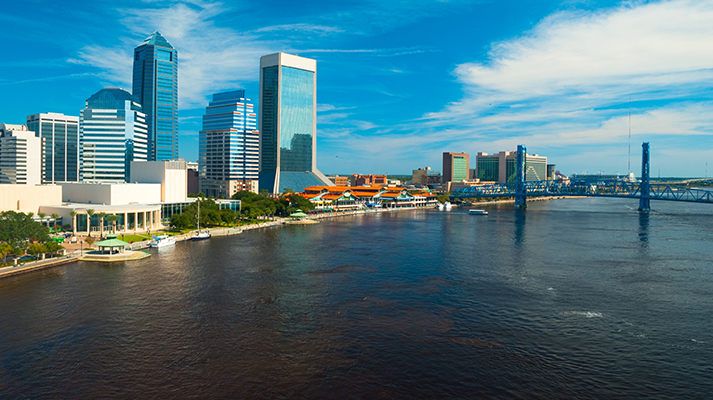 A member of the Waterkeeper Alliance of more than 270 organizations protecting rivers, lakes and coastal waterways on six continents, the St. Johns Riverkeeper is an independent and trusted voice for the St. Johns River and the public to whom it belongs. Brunet-García is a longtime supporter of the nonprofit and seeks its council on environmental issues around water policy for the agency’s work. Yellow House is a place where art + action create change. It is more than a physical space; it is a hub for educational outreach and collaborations among artists, writers, organizations, and communities. Earlier this year, Yellow House founder Hope McMath contacted Brunet-García to build a visual identity as lyrical as the nonprofit’s name. 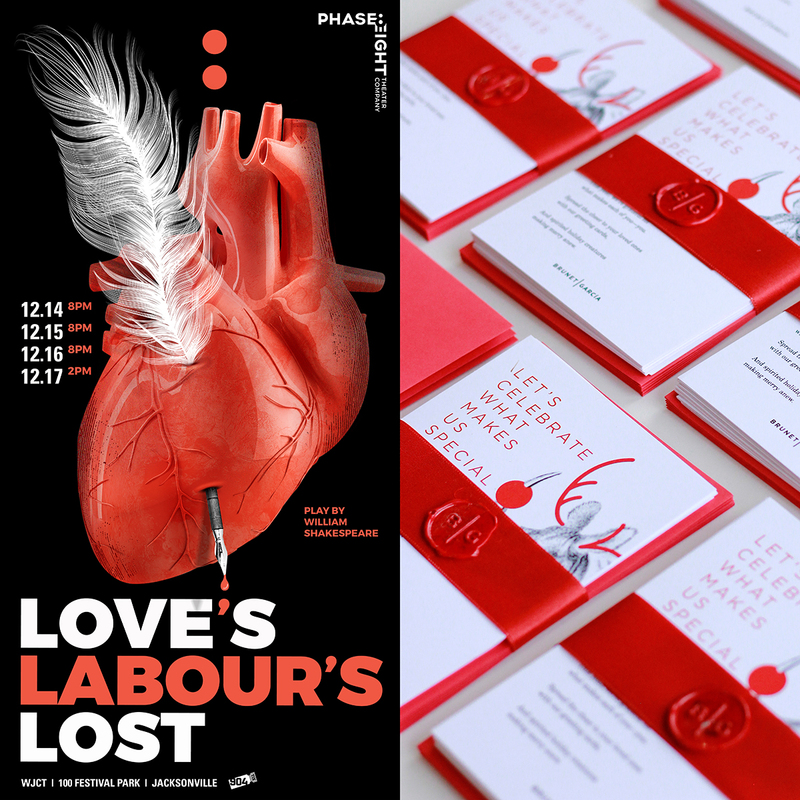 In addition, the agency designed stationery, business cards, and posters; animated social media teasers; programmed digital invitations for the debut exhibition, and created customized packages for local media.